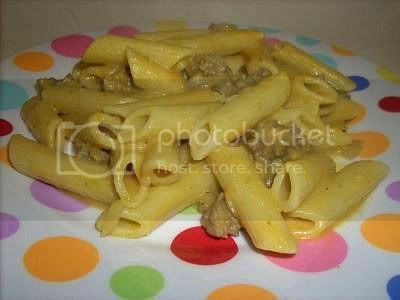 This pasta… omg, I’m so in love with this pasta. I think I could have it once a week for the rest of my life and never get tired of it. Now for the bad news. It’s a Rachael Ray recipe. Excuse me while I eat every bad word I’ve ever said about her recipes. This has restored my faith in her so much that I’ve actually got another one of her recipes on tomorrow’s meal plan. Crazy or what? But I will say that the whole “three turns around the pan” thing still makes me want to scream. If you put 1/2 cup, just leave it as that. I don’t mind washing an extra measuring cup. Okay, thanks. 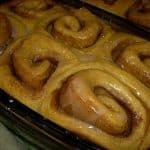 I’ve had this recipe saved in my blogreader for months now. 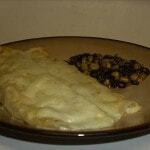 See, we have a favorite enchilada recipe and I was a little nervous to try a new one. But let me tell you, it was worth it. It was even worth the $8 I had to pay for Monterey Jack. The honey and lime somehow… just worked. The honey was more noticable and it went fabulously with the chili powder. The spicy and sweet… YUM! I posted the recipe on a forum I frequent and I’ve already had two people tell me that they tried and loved it. I definitely recommend this for EVERYONE and I’ll be making it again as soon as I find Monterey Jack on the cheap. Oh, but make more of the honey mixture! I didn’t have nearly enough. It’s pumpkin week in our house! I bet your rolling your eyes just like the husband did when I told him about it. But I seriously adore pumpkin. 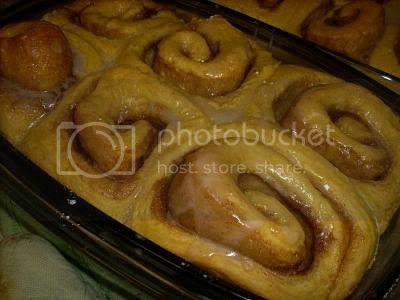 I made these pumpkin cinnamon rolls last night and there’s only one left. 13 cinnamon rolls gone in less than 24 hours. I’d say they were a success. I especially love the icing. Most cinnamon roll icing is just vanilla flavored but this one has cinnamon. So good. One more thing.. the recipe says it makes 2 dozen so I halved it and still got 14 out of it. And they’re HUGE. I would definitely recommend cutting it down unless you’re making them for a big group. Bake at 350Â° for 22-28 minutes or until golden brown. In a small mixing bowl, combine the water, butter and cinnamon. Add confectionersâ€™ sugar and vanilla; beat until smooth. Spread over buns. Serve warm. 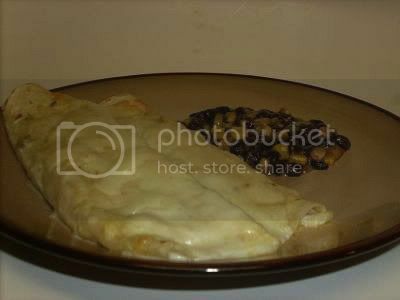 This weeks TWD recipe was chosen by Tammy of Wee Treats by Tammy. 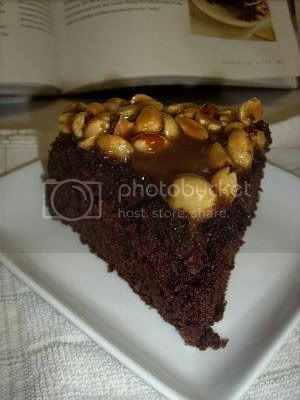 She chose Dorie’s Caramel Peanut Topped Brownie Cake. I can’t begin to tell you how excited the husband was when I showed him the picture in the book. And he was not disappointed. This recipe was so much easier than I expected. The cake came together in no time and for the first time ever (!) the cake was done in the time Dorie said it would be! Seriously, that never happens. No matter what I’m cooking. The caramel took much longer than Dorie sai but it was worth the time. I need to remember this recipe next time I need a simple but impressive cake. It really was great! Thanks to Tammy for the great choice! Forgive me for being late. Between Hurricane Gustav and having strep throat, I didn’t even realize that yesterday was Tuesday. 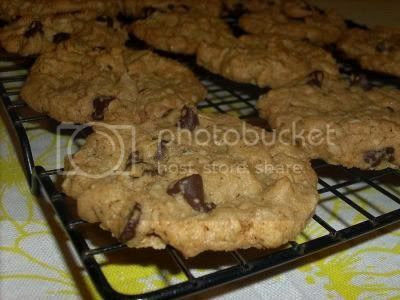 But anyway, this week’s Tuesdays with Dorie recipe is Peanut Butter and Oatmeal Chocolate Chipsters (I so just typed Chipper. Must not watch Braves games while updating blog.) and it was chosen by the lovely Stefany of Proceed with Caution. Honestly, I made these a few weeks ago and really don’t remember much about them. They were good and my little family enjoyed them but apparently they weren’t very memorable. If you want the full recipe visit Proceed with Caution. Next week I hope to back to normal so I should actually be able to remember the recipe.